Doctor was great, helpful and knowledgeable. It took nearly an hour to see the doctor from when I got in. Ihad a 9am appt and didn't see the doctor till 10am. A lot of waiting. I'm hoping it was because I was a new patient, but I have a follow up appointment and we'll see. Doctor was great, helpful and knowledgeable. It took nearly an hour to see the doctor from when I got in. I had a 9am appt and didn't see the doctor till10am. A lot of waiting. I'm hoping it was because I was a new patient, but I have a follow up appointment and we'll see. The doctor made me feel a lot better he know exactly what I had when i explained what I have beenexperiencing. The doctor made me feel a lot better he know exactly what I had when i explained what I have been experiencing. Based in Corona and Temecula, CA, Dr. James Kalkanis is a surgeon specializing in head and neck surgery. He received his medical degree from Loyola University Chicago. He completed his residencies in otolaryngology and general surgery at Southern Illinois University, Springfield. Dr. Kalkanis also pursued a fellowship in facial plastic surgery at the University of Chicago. He is a certified ear, nose, and throat doctor by the American Board of Otolaryngology. Dr. Kalkanis attends to patients at his own practice. He prides himself on several years of experience and specializes in nasal deformities, head lumps, facial injuries, sinus problems or sinusitis, and dysphagia. He is an esteemed member of the American Academy of Otolaryngology. He is also affiliated with Corona Regional Medical Center, Inland Valley Medical Center, and Rancho Springs Medical Center. 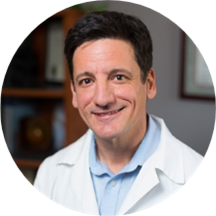 Dr. Kalkanis is a dedicated provider who carefully listens to his patients and provides sound advice that would benefit them. He believes that we all share a basic desire to be seen and heard and that the experience of therapy offers us compassion, understanding, and courage. He focuses not just on the ailment but also on the general well-being of the patient. Dr. Kalkanis was very nice and explained everything that would be done.